Vines serve many useful landscaping purposes and are excellent to use where space is limited, as dividers or barriers. They can screen unsightly views or provide privacy for the patio or deck. The monotony of a long fence or blank wall may be broken with vines. They can soften harsh structural lines and blend the structure with other plantings. Where grass is difficult to establish and maintain on steep banks, vines can be used as ground covers. They can be established on trellises against buildings to provide shade, thereby improving energy efficiency for cooling. Selection of a suitable vine depends on its intended use, location, soil adaptability, and type of support. Dense, coarse foliage is desirable if a screen is needed. A fine-textured, slow-growing vine should be selected to add pattern and interest to a stone or brick wall. A decorative vine should possess desirable flowers, fruit, or foliage for seasonal interest. Three of my favorites are clematis, coral honeysuckle, and climbing hydrangea. CLEMATIS (Clematis sp.) is among the most decorative and spectacular of all the flowering vines. A wide range of colors and flower shapes may be found in the many varieties and species offered for sale. 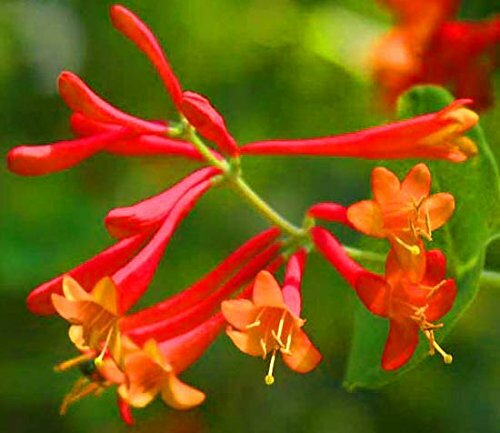 CORAL HONEYSUCKLE (Lonicera sempervirens) is a native, evergreen twining vine that grows 3-20’. It has showy, trumpet-shaped flowers, that are red outside and yellow inside, in clusters at the ends of the stems. It attracts hummingbirds to your garden. CLIMBING HYDRANGEA (Hydrangea anomals petiolaris) has very showy, flat-topped flower clusters in summer; glossy, dark-green leaves; and exfoliating winter bark. It is slow to establish but once it is well-rooted it grows rapidly with clinging roots that will attach to structures and supports. Join the Extension Master Gardener℠ volunteers of Union County at their monthly educational meeting on Thursday, August 16, at 7 p.m., at the Union County Agriculture Center, 3230 Presson Rd, Monroe. The topic will be Moles & Voles.